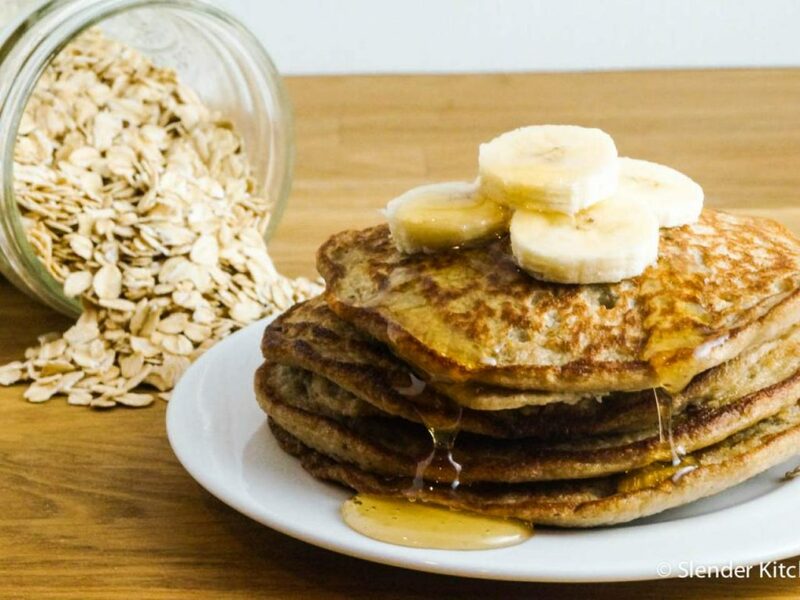 This makes for a hearty, no-fuss breakfast, Banana Oatmeal Pancakes are perfect. They’re fluffy and tender and the batter is made in minutes, entirely in the blender. Give your pancakes an extra kick when you top them with butter and a generous drizzle of real maple syrup! These pancakes are a cross between a crepe and a traditional pancake. They are delicately sweet from ripe bananas rounded out with the warm nuttiness from the oats. And so tender that they melt in your mouth tender. Hungry yet? Combine oats, baking powder, salt, milk and banana in a blender pitcher; blend until smooth, stopping the blender and stirring the mixture with a spatula as necessary to keep it moving. Add eggs, honey and vanilla and blend just until combined. (If your batter seems too thick, add milk to the blender a little at a time until it reaches your desired consistency.) Pour batter into a medium bowl for scooping. Heat large skillet over medium heat until hot; add 2 teaspoons butter and swirl to coat. Scoop batter by 1/4 cupfuls onto hot skillet and cook until batter starts to bubble. (If batter seems to be cooking too fast, reduce heat; too slow increase heat slightly.) Flip and cook through. Transfer to serving plate and repeat with remaining batter. Serve pancakes with butter and real maple syrup. Note that you’ll need a 1/4-cup measuring cup to scoop the batter.